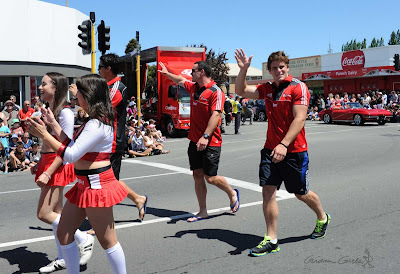 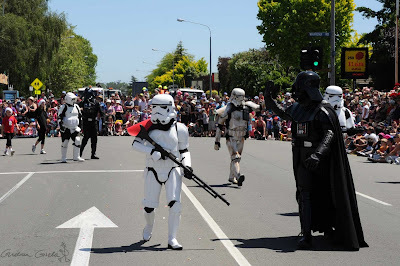 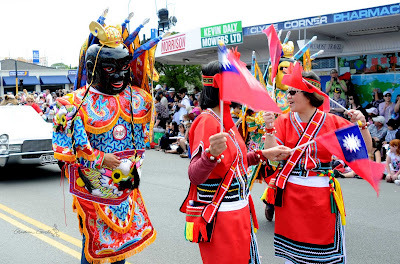 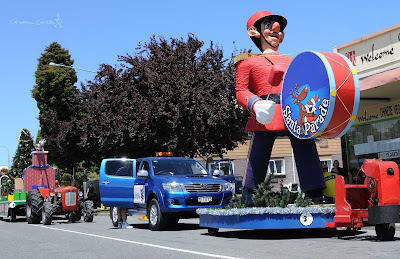 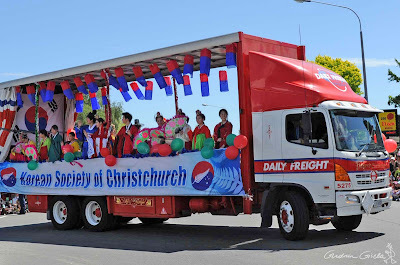 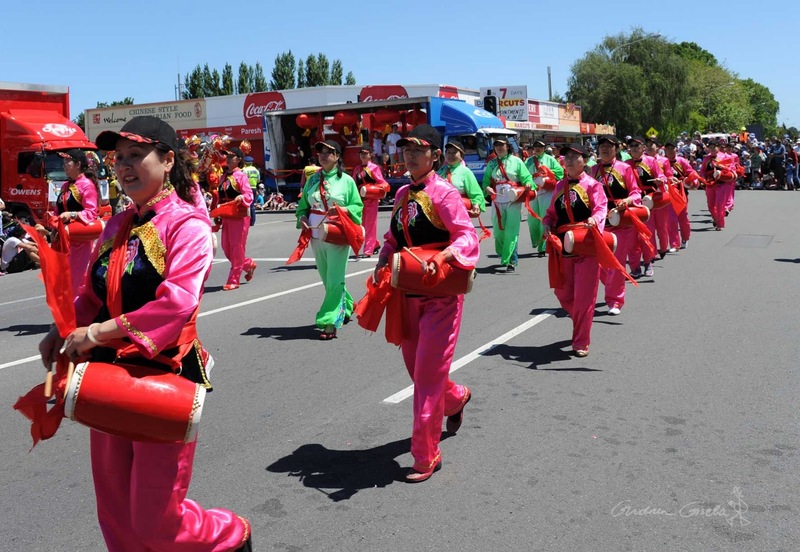 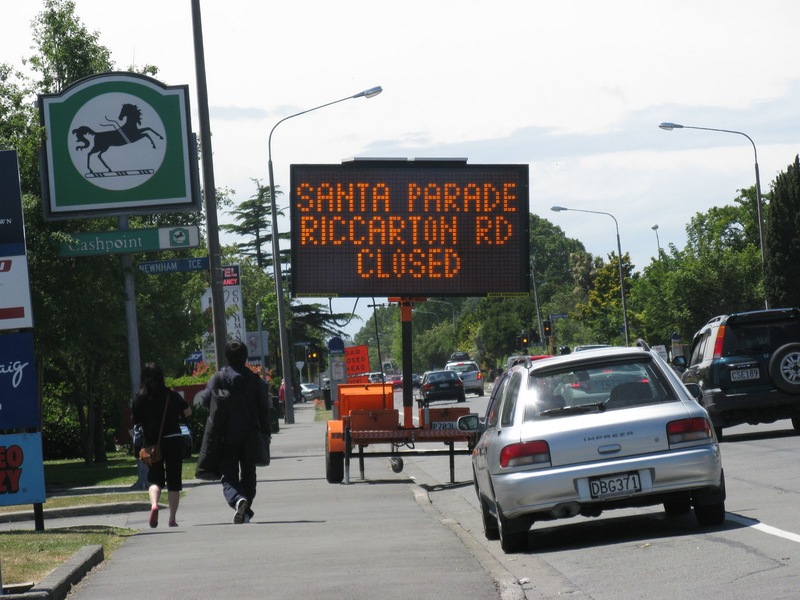 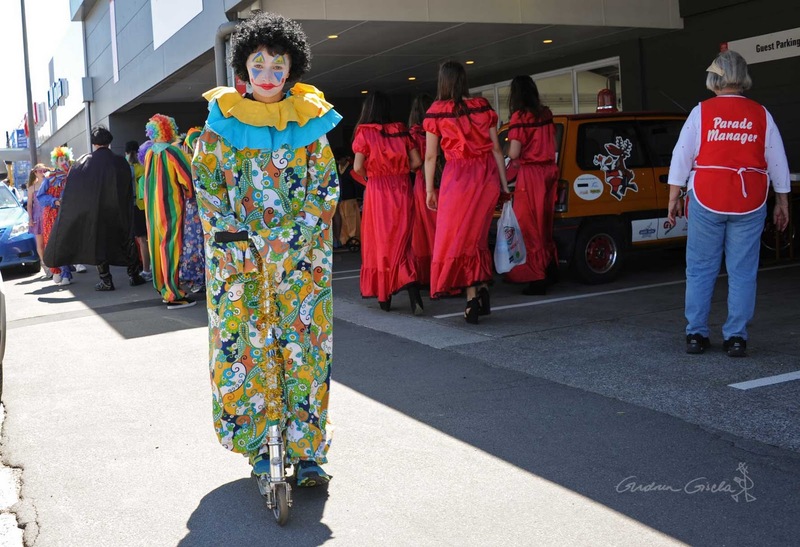 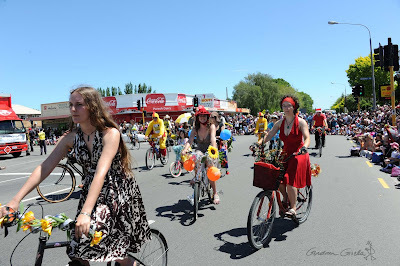 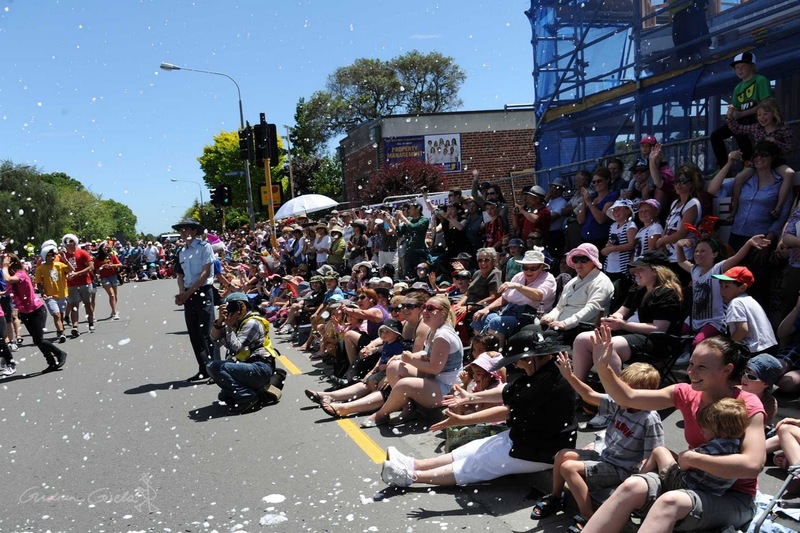 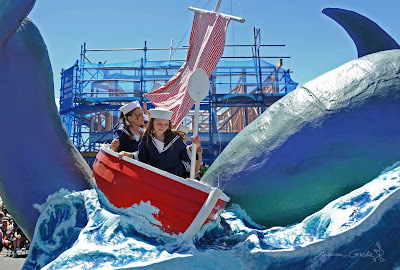 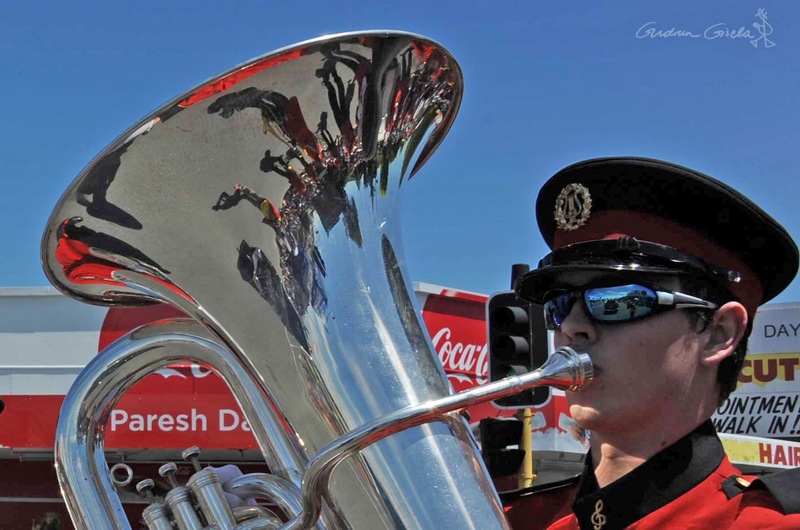 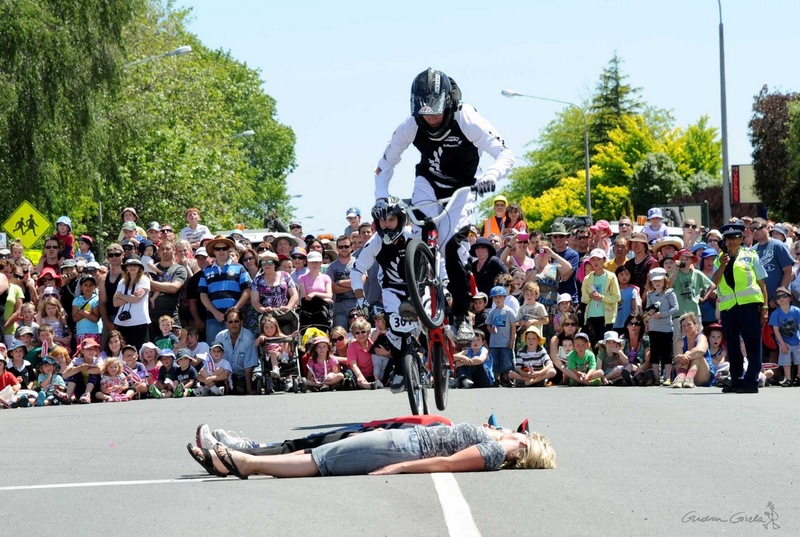 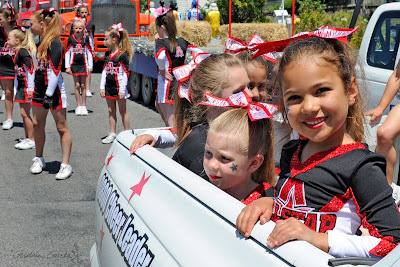 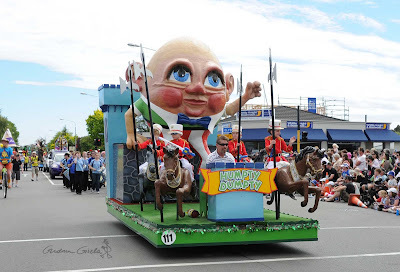 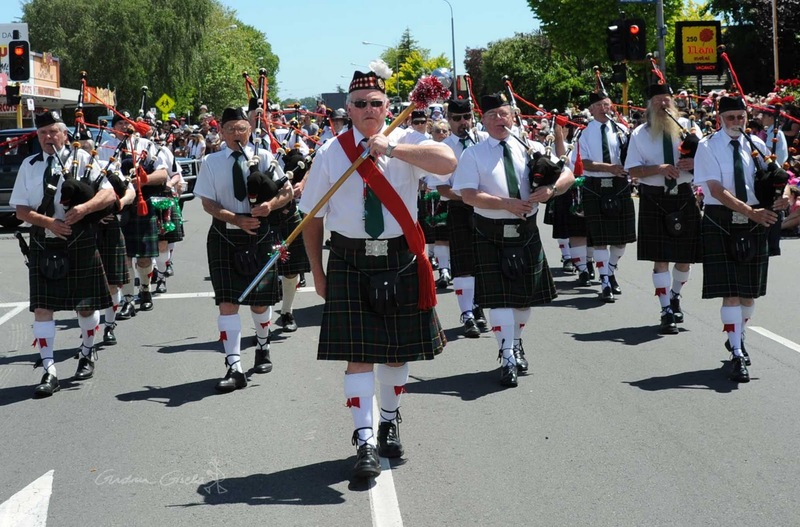 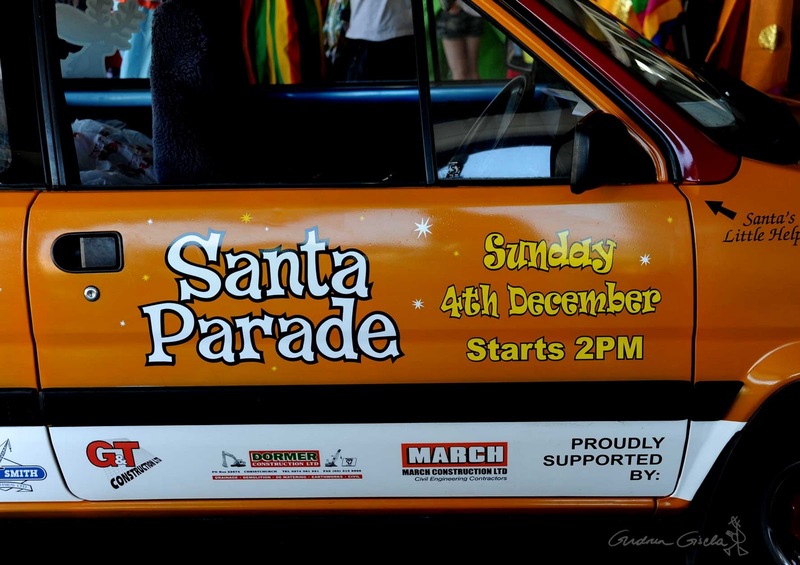 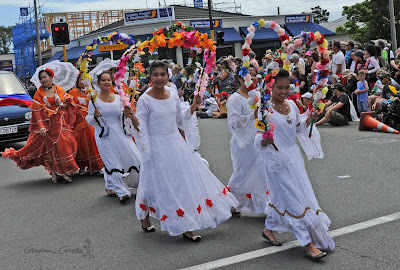 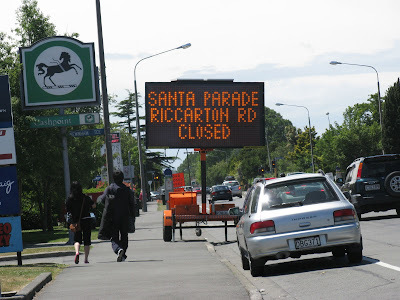 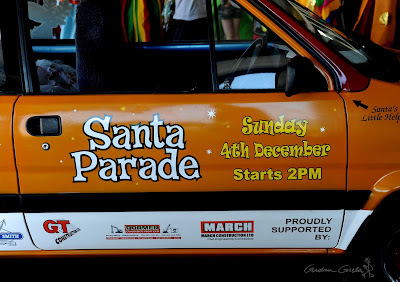 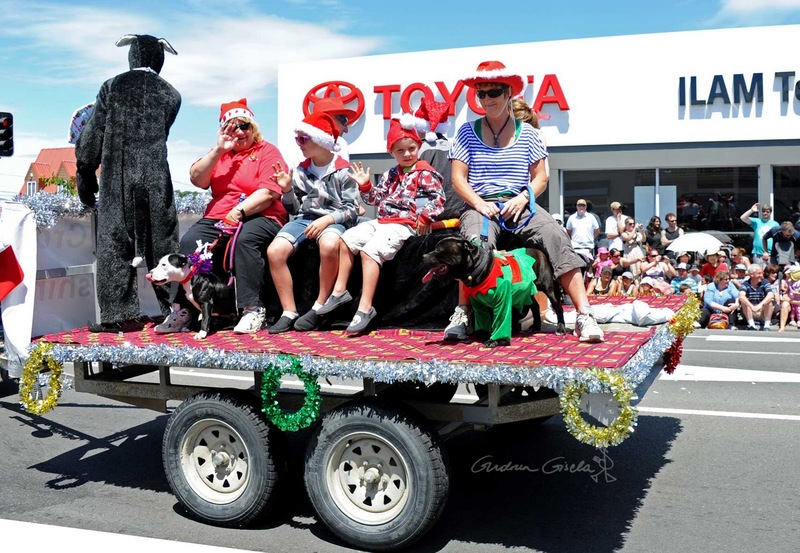 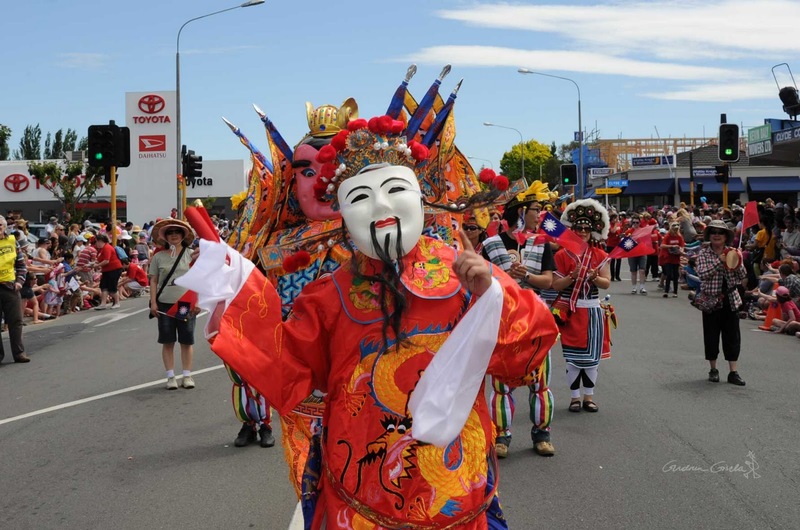 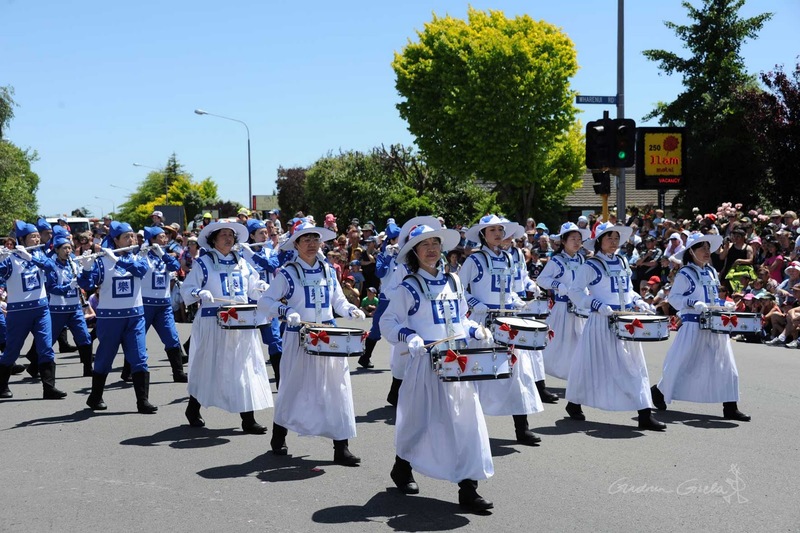 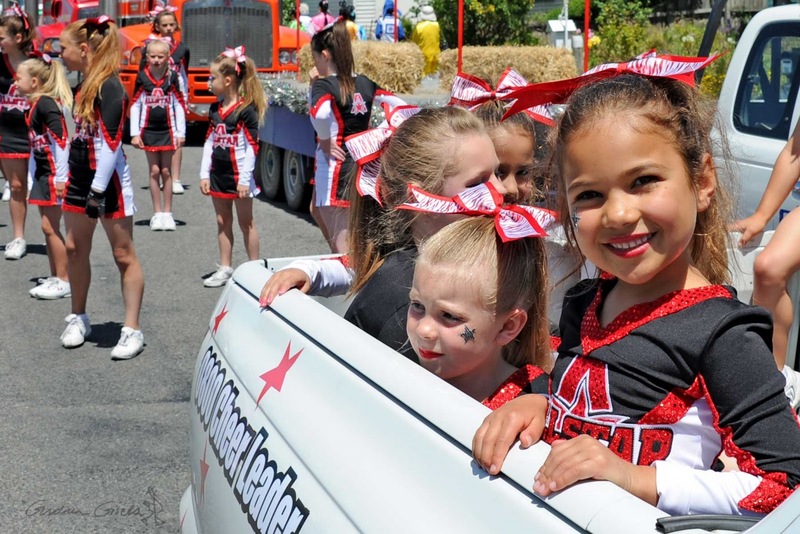 With Santa's traditional parade route still inside the cordoned off CBD, Riccarton Road became Main Street Christchurch for the 65th anniversary event. 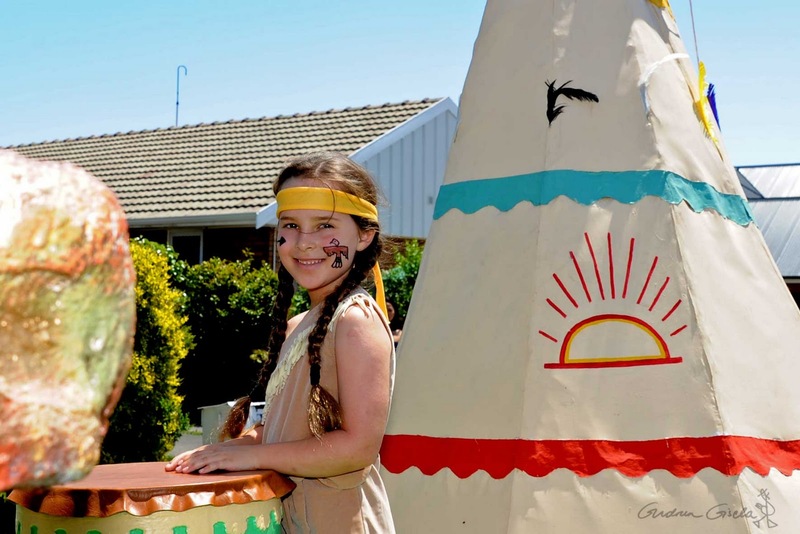 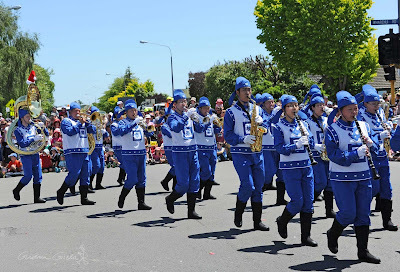 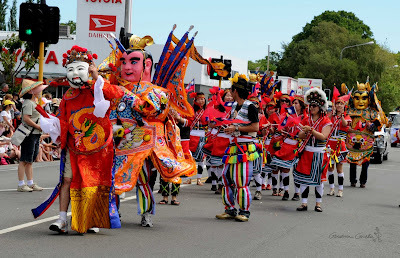 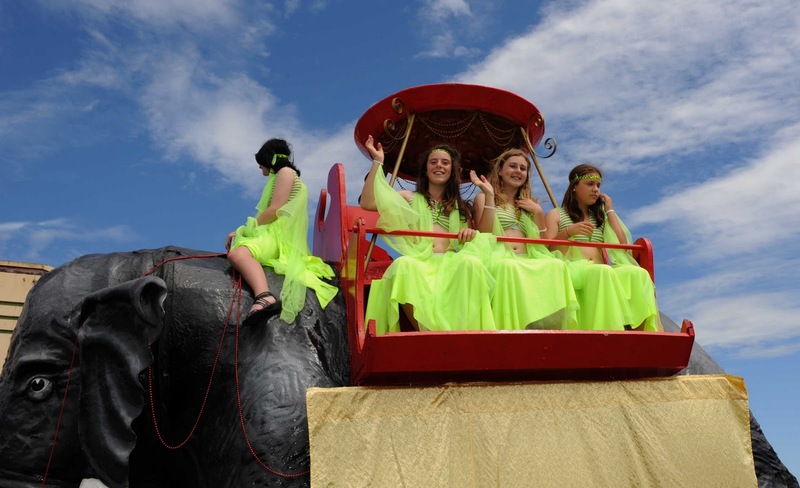 The parade lines up in Wharenui Road, just around the corner from the main route. 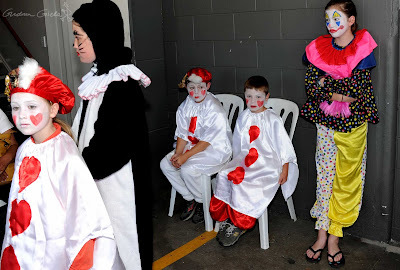 A word from their sponsors. 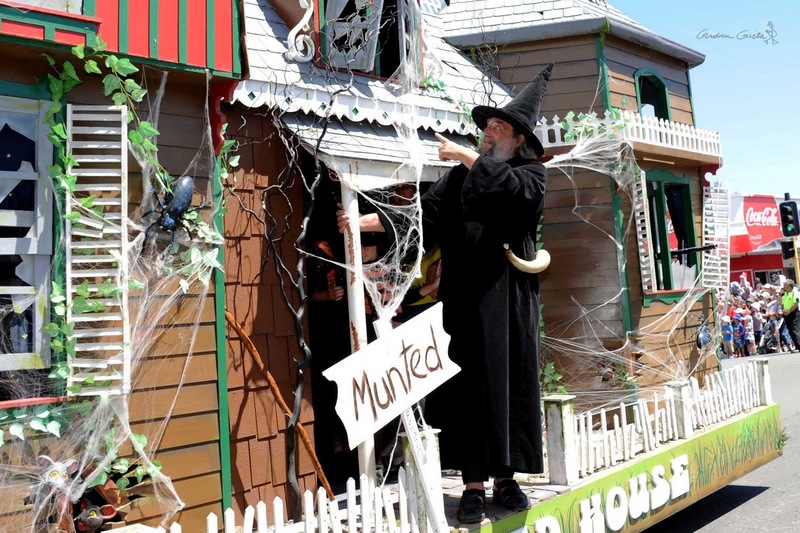 A big emphasis on construction and demolition this year. Behind the scenes, the Christmas fairy receives her finishing touch. Alice in Wonderland playing cards and others await their call. 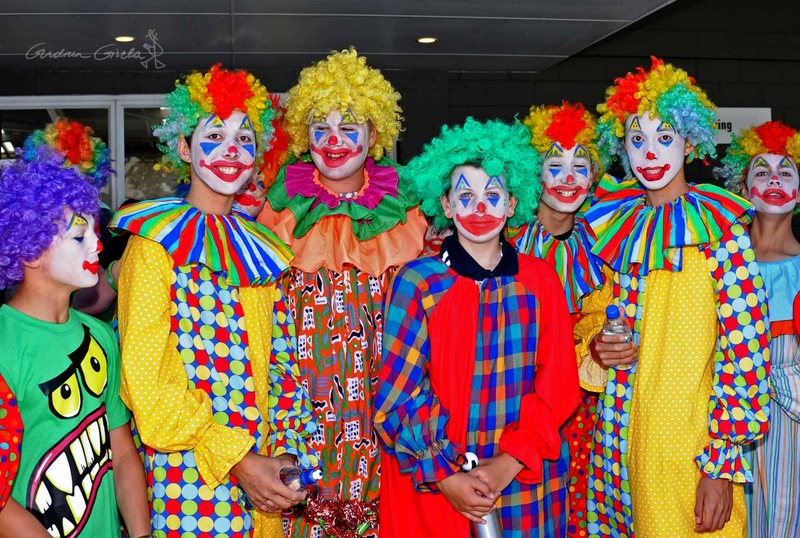 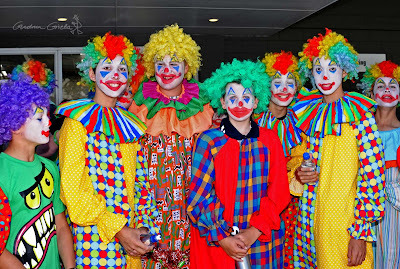 Real clowns ready for action. 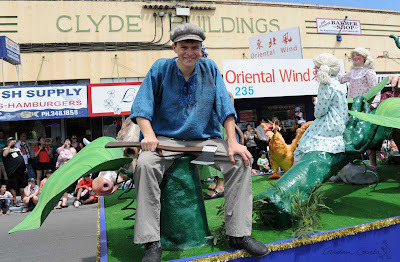 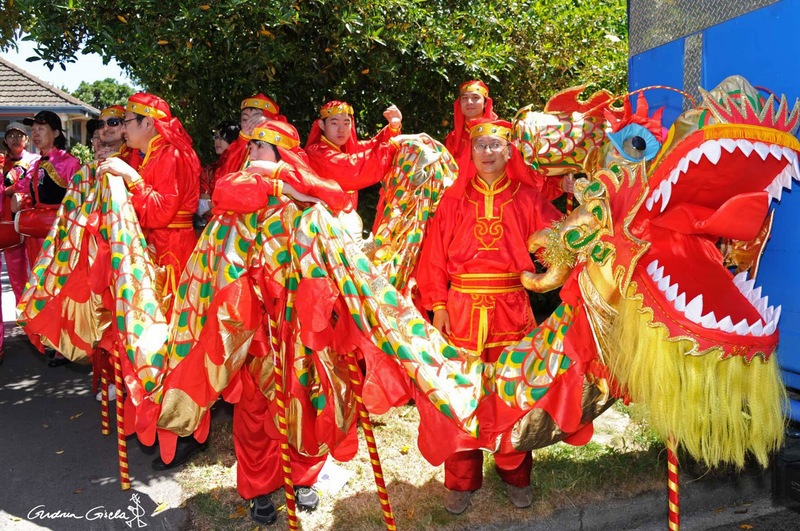 Backstage with the Chinese Taniwha. No risk of Santa running out of dragons this year. 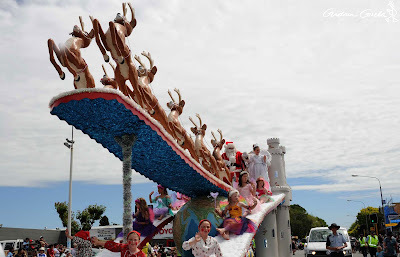 The mighty sleigh under way. 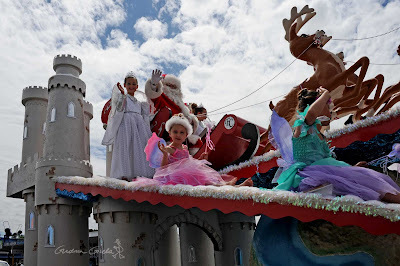 Santa and his team of fairies. 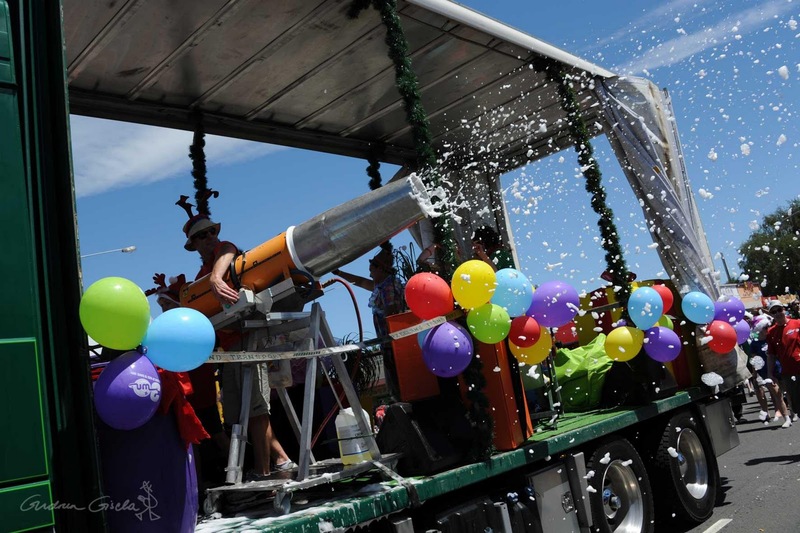 The snow machine in action. 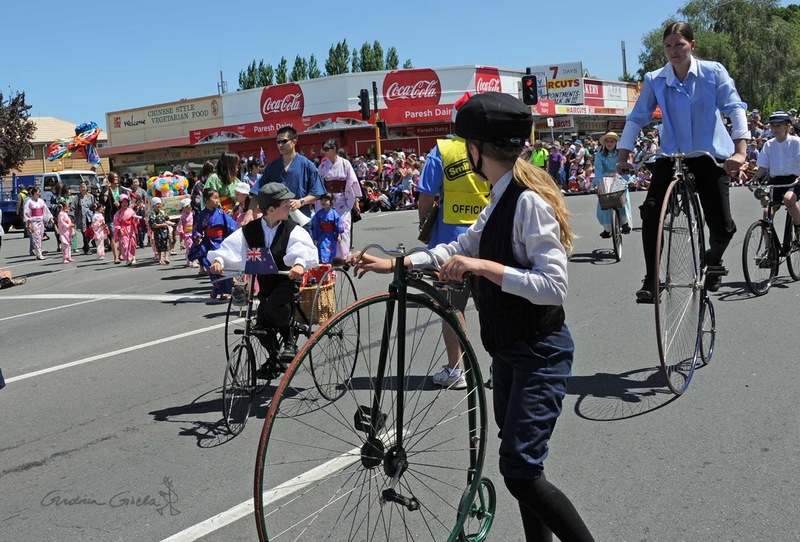 Bicycle business: Seriously vintage cycles. Flower ladies, chickens, and a Santa impersonator. 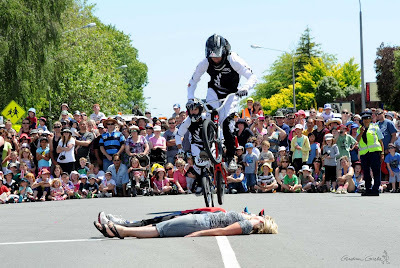 BMX daredevils and trusting volunteers. Proudly representing Scotland and Scottishness. 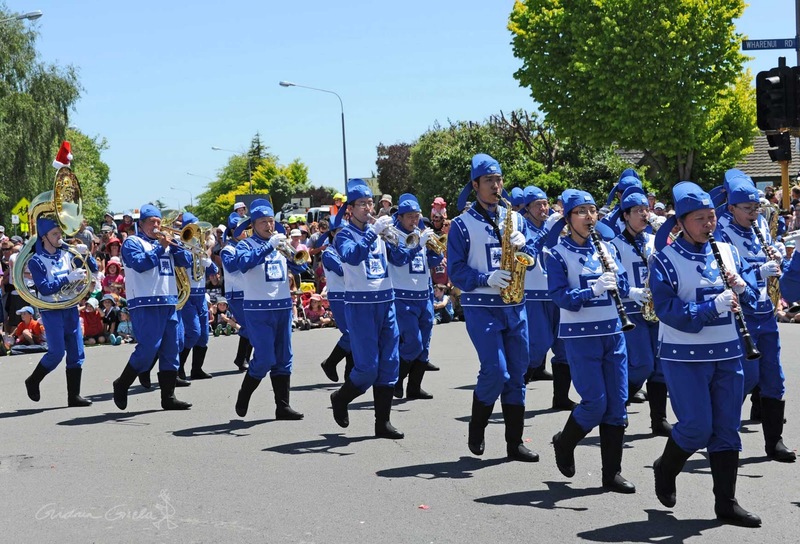 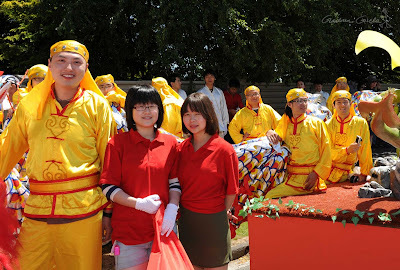 The Falun Dafa marching band. 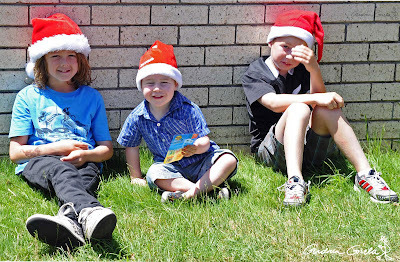 Not easy to round up at this time of year? 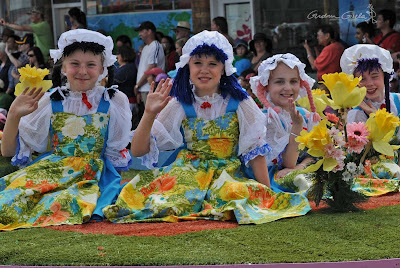 A few crowd-pleasing Crusaders, complete with cheer squad. 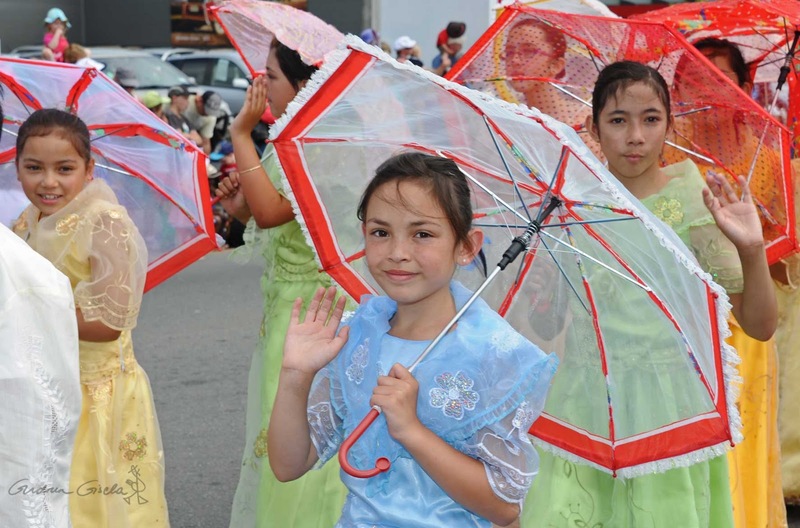 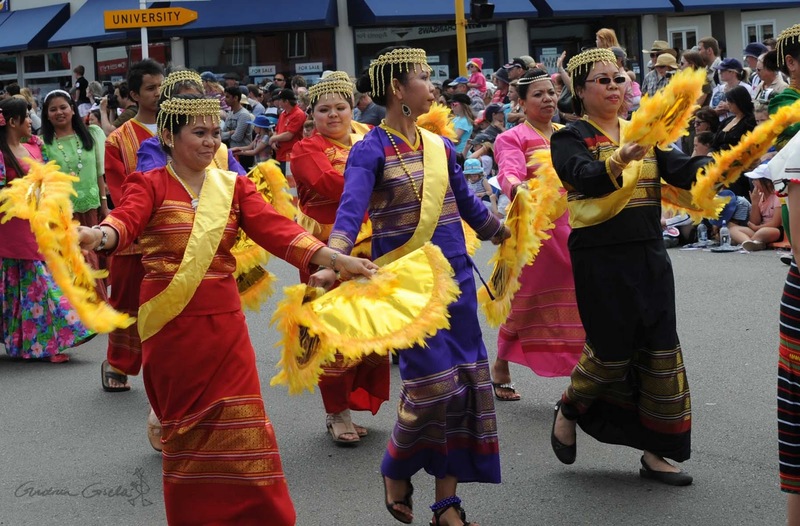 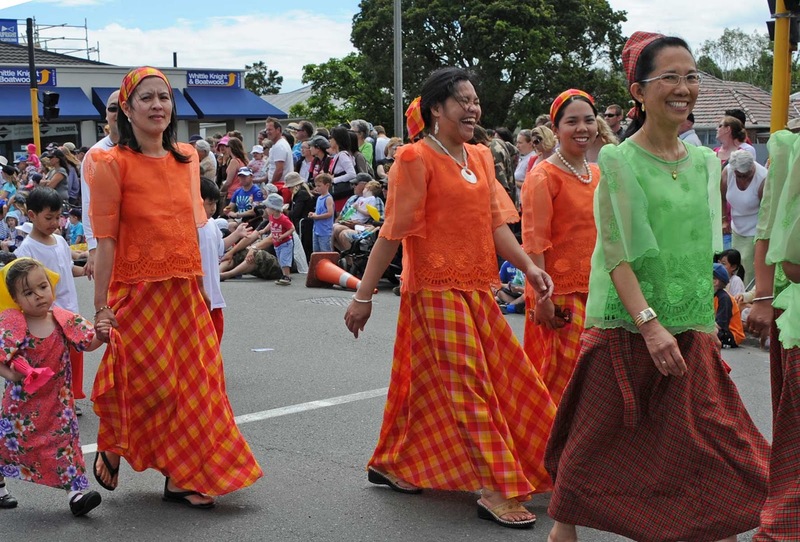 Parasols and frocks - the Pinoy (Philippines) contingent. 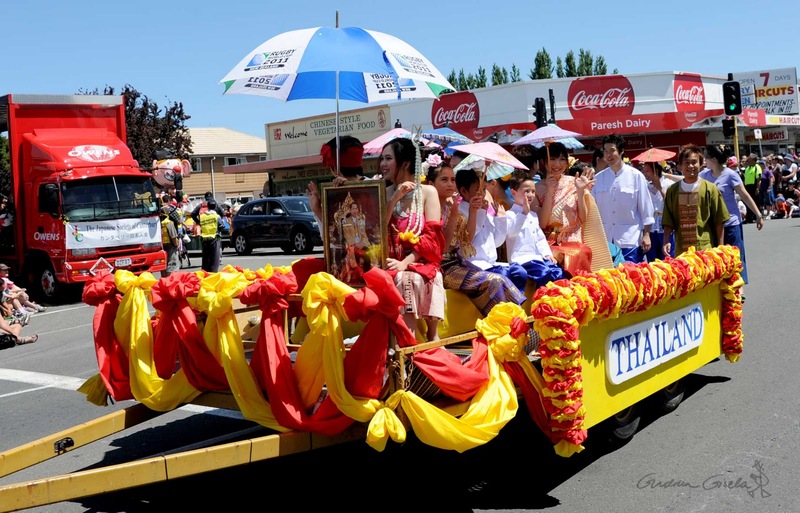 Smaller parasols and fan dancers - Christchurch Thais supporting Santa. 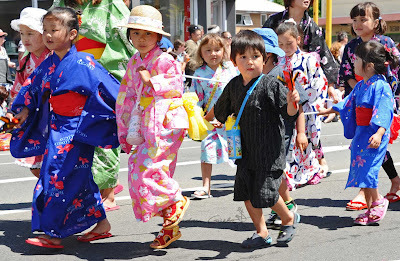 The kimono kids win the hearts of the crowd. 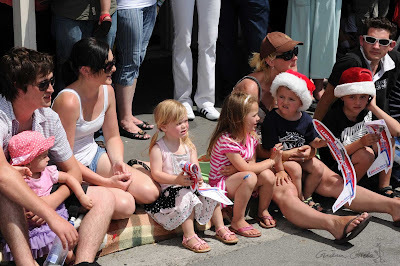 Faces from the audience along Riccarton Road. Elephant beauties - howdah you do. 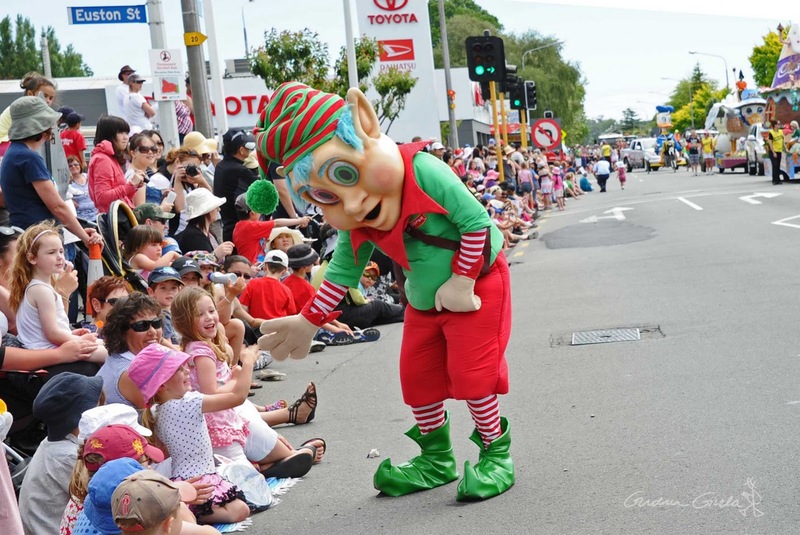 The elves seem to get bigger every year. 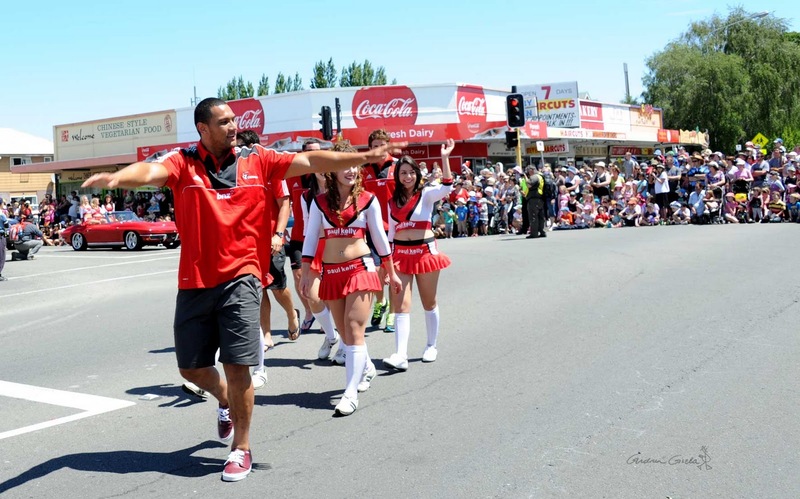 Jack fells the beanstalk once again. 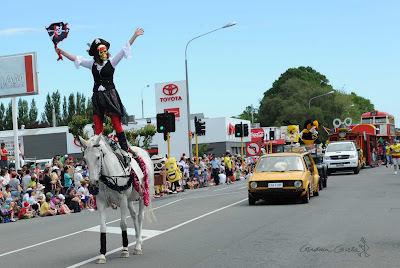 Equestrian piracy - a big hit with the crowd. 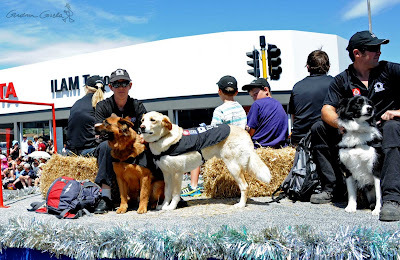 Working dogs receive the acclaim of the crowd. The Wizard of New Zealand makes a surprise appearance from inside the haunted house, renamed munted house in acknowledgement of the earthquakes.